Get the best of both home automation and security with our top five best smart home security systems. Looking for the best smart home security systems with home automation features? See how the best compare and start building your smart home. Home automation no longer requires you to “clap on, clap off.” With just the push of a button, you can now control more than your lights—you can turn on your dishwasher, lock your front door, and scare the pants off the FedEx employee by yelling “Thanks!” from your doorbell camera. We think it’s a smart idea to pair home automation with home security. When we reviewed home automation systems, many of them were also top contenders for the best home monitoring and security systems. To rank our top five best smart home security systems, we compared monitoring prices, features, and whether the system was compatible with other well-known automation devices like Google Home or smart thermostats. Our top choice, Vivint, offers the best in home automation and security technology—plus it has a no-contract option. The Vivint Sky App lets you add some mood lighting, turn up the heat, or lock your front door—all from your smartphone. It also allows you to get really granular with how you set up your security system. If you run to pick up your child from school every day at 2:30 p.m., your system will remember to set your alarm for you. Also impressive is Vivint’s equipment, which is all designed in-house and comes with loads of extra features. For example, the SkyControl panel has a two-way talk feature that lets a Vivint rep try to contact you through your control panel—and you can answer back. No more scrambling to find your phone and answer their call to cancel a false alarm. And you can also pull up live video feeds from your security cameras on the SkyControl panel or in the Vivint mobile app to monitor your home in real time. Plus Vivint’s Ping camera and doorbell camera have a two-way talk feature, so you can tell your neighbor’s daughter to come back this evening to sell you Girl Scout cookies. “So what’s the downside?,” you ask. Vivint is on the pricier end of the spectrum in terms of equipment costs. Equipment packages start at $549.99, and you’ll have to pay all of that up front to qualify for a no-contract option. Vivint also has no DIY installation option, so you’ll need to factor in the $49.99 installation fee into your total cost. But we still think the price is worth it to get your hands on some of the best home automation technology in the industry, like two-way talk, live video feeds, and custom security settings. A close runner-up, ADT Pulse® provides a well-rounded home automation service, but steep costs keep first place just out of reach. ADT offers professional installation (no DIY) and allows you to dim the lights for date night, turn up the thermostat on a chilly morning, or open the front door when your partner forgets their keys. Its service is also compatible with Z-Wave devices, so you’ll be able to tell Alexa to turn on the lights or use the ADT Pulse® app to adjust your Nest thermostat while you’re away. But if your set of sensors and cameras looks familiar, you might be right. ADT uses the same equipment as other home security companies, and it definitely lacks the innovative qualities of Vivint’s equipment that’s designed in-house. There is one caveat, though: for a security event to trigger the ADT monitoring service—and have them contact the police or fire department on your behalf—the event alert has to come from an ADT device. Scrappy startup Abode offers a low-cost, fully DIY home automation and security option—a renter’s dream. Are you all about getting hands-on and tinkering with technology? Then Abode’s do-it-yourself smart security system might just be your jam. For renters, the easy-as-pie installation is a match made in heaven since you won’t need to grab the putty knife and fill in holes when you move out. Instead, the control panel and sensors attach with adhesive backing. An extra bonus: If you have to pick up and go because your lease is up, you changed jobs, or you’re moving in with your best friend’s sister’s cousin, you won’t have to worry about paying contract cancellation fees. All of Abode’s packages are contract-free. Abode is also Z-Wave, Zigbee, and If This, Then That (IFTTT) compatible, so you can mix and match a wide range of smart light bulbs, locks, thermostats, appliances, and more, including digital assistants like Nest, Alexa, and Google Home.2 Additionally, the starter kit has a low up-front cost (compared to competitors) and comes with most everything you need. We say “most everything” because the kit lacks a couple of items that you might consider essential. A wireless keypad will cost you extra, as will any security cameras. If your focus is mainly on home automation, these may not be a deal breaker and can be added on if you consider them a must-have. What makes Abode tops for anyone looking for a budget home automation service is its Basic package that rings in at a whopping F-R-E-E. While you’ll have to rely on your own eagle eyes to self-monitor, this is the perfect option if you’re really only shopping for a home automation service. If you think 24/7 monitoring might come in handy, you can always upgrade to the still-affordable Connect or Connect + Secure plans—or get three to seven days of on-demand monitoring for a one-time fee. Another top choice for renters and DIY-ers, Scout offers a low-cost, minimalist approach complete with full home automation control. All it takes is a few minutes to set up the Scout smart home security system. And renters rest easy—there’s no need to get your Home Improvement toolbelt. Just like Abode, Scout uses adhesive backing to stick to your walls. Scout also has a free option, but it limits you to web-based self-monitoring (no app access) and the basic alarm siren. That’s way too minimalist if you ask us, and if you want to dive into home automation, you’ll need the monthly plan. Still, there’s no contract required, and Scout’s monthly fees won’t make your jaw drop. It’s well worth it to get the IFTTT, Z-Wave, and Zigbee integration, as well as support for Alexa, Google Home, Nest, Samsung SmartThings, and more. We mentioned Scout’s security approach was minimalist, and we meant it. It offers only a main hub, window and door sensors, motion sensor, and water sensor—plus two key fobs and an RFID sticker. Though you could always add a camera of your choosing—we’ve picked some of our favorite wireless security cameras here. With thoughtful design and technology that puts homeowners first, Nest Secure gets us excited about what’s coming next. “Thoughtful” is the word that first comes to mind when we think of Nest Secure, and chances are you’ll see us repeat it at least a few times here. Not only does each device included in the kit have that sleek, Apple-esque design, it contains technology that shows Nest was thinking of homeowners first. For example, the Nest Detect’s Quiet Open button blew our mind. Need to let your pup out for a quick potty break? Just press the button as you open the door, and your system stays armed with no alarm bells blaring. Additionally, Nest is powered by its own Wi-Fi protocol called Weave. This allows the security system’s hub to always be on, but it conserves energy by waking up the battery-powered sensors only when there’s activity. It also comes with tiered-trust domains, which means a would-be burglar can’t unlock your front door just by hacking your patio lights. Of course, innovative technology comes at a high price, which is one reason why Nest Secure wasn’t our top pick. As for monitoring, Brinks (previously MONI, which manages Nest Security) offers only two packages, and we felt the prices weren’t overly competitive with some of our other picks.3 Plus, you’ll have to agree to a three-month contract to land the lower monthly rate. That said, Nest Secure smoothly integrates with other Nest home automation devices, as well as Yale locks, Google Home, Alexa, smart light bulbs, certain smart appliances, and more. 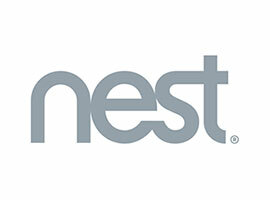 So, if you’re willing to wait for IFTTT integration or simply know you prefer Nest products, it’s a good choice. Best overall—Vivint Smart Home lets you customize your smart home alarm system on a whole new level with feature-packed proprietary equipment. Runner-up—ADT Pulse is a widely recognized home security brand that offers redundant call centers for an extra layer of protection, but steep costs keep it in second place. Best budget pick—Abode comes with DIY installation and no contracts, but if you want a control panel, you’ll need to fork over a little more dough. Best DIY—Scout is another top DIY pick with no contract, but you’ll need to pay month to month to get the full set of home security and automation features. Best tech—Nest Secure’s equipment offers innovative features like Quiet Open, but the monitoring packages don’t offer many choices. Hacks, Distributed Denial of Service (DDoS) attacks, breaches . . . keeping up is enough to give a security pro a headache. But the good news is, you don’t need to be a pro to take steps to add a layer of defense to your home automation system. Here are a few tips to help keep your home automation system secure. It bears repeating: don’t just stick with the default password. This goes for anything connected to your network, like your router, cloud account, or smartphone. Use a combination of letters, numbers, and symbols to create a strong password—and avoid using anything that makes the list of most commonly used passwords. It’s also a good idea to add two-factor authentication to your account if you can. This adds yet another layer of protection to keep would-be hackers away. New vulnerabilities are discovered every day, and responsible companies constantly publish software and firmware updates to keep you ahead of the security game. Set a reminder to check for software updates to your home automation and security system at least once a week, and don’t forget about your router and computer too. If you have security cameras as part of your smart alarm system, it’s likely you can check the history to see who’s accessed the feed. Take a peek at the logs regularly and make sure you recognize the IP addresses listed there. If you discover one you don’t recognize, immediately change your password and let your security service provider know. Not sure how to find your own IP address—or maybe you’re not sure what an IP address even is? Don’t worry, Google has an easy IP addresses guide to help you figure all these things out. Similarly, it’s a good idea to keep track of who has a passcode for your alarm. That way, if someone you no longer want to have access has the code, you know to change it. IFTTT, Z-Wave, Zigbee, Insteon. Home automation languages don’t come with a Rosetta Stone course, but it’s not difficult to learn how each one works. If you’re new to home automation, these are the languages that allow each smart device to “talk” to the hub and to each other, so every bit of your home’s Internet of Things (IoT) is connected. But creating IFTTT recipes and learning how to make your devices “talk” to each other in the right way takes some research and experimentation. Check out our home automation languages guide to jump in and see what it’s all about. Looking for a system more focused on home security? Take a look at our top five picks for the best wireless security systems.